What does it mean when someone had a big stroke? Often referred to as a large vessel stroke, a stroke in the region of the brain called the cerebral cortex can affect a large area and can have significant consequences. This type of stroke can cause substantial swelling or bleeding in the brain, which may be life threatening, requiring fluid restriction or emergency surgery. Lasting effects of a large cortical stroke include weakness, language problems, personality changes, vision loss, and seizures. The cerebral cortex refers to a wide, thick area on the outer surface of the brain which is primarily composed of a type of tissue called grey matter. Neurons of the cerebral cortex appear grey under microscope in contrast to the subcortical area and the brainstem which are located deeper in the brain and are composed of heavily insulated white matter. It is extremely rare for a stroke to affect both sides of the cerebral cortex because the blood vessels that supply the right and left sides of the brain diverge in the neck long before they enter the brain. The arteries in the brain branch off from large arteries vessels in the neck. The distribution of particular blood vessels within the brain is quite predictable. When a person has a stroke, the neurological signs and symptoms correspond to a location in the brain, and to the blood vessels that supply the region. This makes it relatively easy for a neurologist to determine which part of the brain and which blood vessels are affected by a stroke- even before a brain imaging study shows visible abnormalities. A stroke is the death of brain tissue due to a lack of blood supply. The signs and symptoms of a stroke depend on which blood vessel is blocked, and thus which part of the brain is injured. The cerebral cortex is the largest part of the brain, and it is divided into sections called lobes. Symptoms of a cortical stroke depend on which lobe of the cerebral cortex suffers from interruption of blood supply. A stroke affecting the front portion of the frontal lobe causes behavioral problems, lack of inhibition, significant memory problems, motor weakness or aphasia (language impairment). Memory and behavior: The lack of memory makes life difficult, but inappropriate behavior in an adult adds another challenging dimension to a stroke of the frontal lobe. A stroke in this location is caused by an interruption of flow of the left or right anterior cerebral artery or the left or right carotid artery. Motor weakness: The back of the frontal lobe is actually located at the middle of the brain, near the top of the head. This area is called the motor cortex or motor strip, and it controls movements of the opposite side of the body. We have a left frontal lobe and a right frontal lobe and they function quite differently from each other. A stroke of the left frontal lobe causes weakness of the right arm and leg, while a stroke of the right frontal lobe causes weakness of the left arm and leg. An interruption of blood flow in the left or right carotid artery or the left or right middle cerebral artery causes a stroke affecting the motor strip of the corresponding frontal lobe. Aphasia: The lower part of the frontal lobe contains a specialized region called Broca's area. The left Broca's area is the center for language production for right handed people and the right Broca's area is the center for language production for left handed individuals. When someone has a stroke affecting Broca's area, speech production is severely impaired, but speech recognition and reading may remain normal. The parietal lobe controls sensation as well as the perception of the world. The parietal lobe is located behind the frontal lobe. 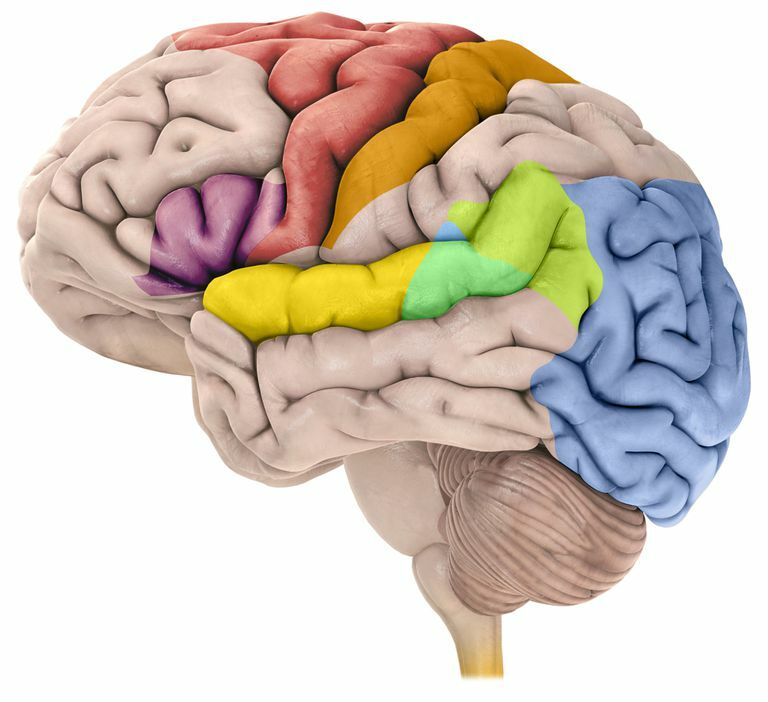 Each side of the parietal lobe controls the perception of sensations such as temperature and touch on the opposite side of the body. Sensory loss: A stroke affecting the left parietal lobe causes a lack of sensation of the right arm and leg, while a stroke affecting the right parietal lobe causes a lack of sensation of the left arm and leg. Decreased awareness: Additionally, the right parietal lobe gives a sense of awareness, so a stroke of the left parietal lobe may cause people to neglect one side of the body, or one side of the environment. This syndrome is one of the most challenging of all stroke deficits for survivors and family members. A parietal lobe stroke is caused by a blockage of a branch of the middle cerebral artery. The temporal lobe is located near the temples on each side, above the ears. The temporal lobe controls hearing as well as understanding language. Aphasia: People who have a stroke affecting the dominant temporal lobe (the left side for right handed people and the right side for left handed people) experience difficulty understanding language and may even try to speak- but can produce garbled words that sound as if they are a different language. It is much easier to recover from a stroke of the Broca's language area than a stroke of Wernicke’s language area. A temporal lobe stroke is caused by a blockage of a branch of the middle cerebral artery. The occipital lobe controls the perception of vision. Vision loss: A stroke affecting the right occipital lobe causes loss of vision of the left side of both eyes and a stroke of the left occipital lobe causes loss of vision of the right side of both eyes. This can occur if the posterior cerebral artery or vertebral artery is blocked. A cortical stroke can be caused by a large blood vessel obstruction, which results in a wide area of brain damage. Bleeding: A cortical stroke has a higher propensity for bleeding than strokes in other regions of the brain, and thus a cortical stroke that originally started from a lack of blood supply can transform to a hemorrhagic stroke. This is one of the more serious consequences of cortical strokes. Seizures: People who experience cortical strokes can also develop seizures later as a result of the brain damage caused by the stoke. Dementia: When many small cortical strokes occur over time, they may cause vascular dementia. Silent strokes: Sometimes cortical strokes are caused by blockage tiny arterial branches, and thus they may be may be small or even silent. If you or a loved one has had a large stroke, there may be a long recovery. Post stroke rehabilitation is often necessary as you learn to maximize your function after a stroke. Wahl AS. State-of-the-Art Techniques to Causally Link Neural Plasticity to Functional Recovery in Experimental Stroke Research. Neural Plast. 2018 May 27;2018:3846593. doi: 10.1155/2018/3846593. eCollection 2018.